Never a day goes by that I don’t ask the question about my faith and my life of faith. I doubt any serious Christian would go through life without asking the same: How does my faith impact my relationship with God and vice verse? Do I live in certain intimacy with the divine nature? Do others see God in me as I relate to them? How credible a witness am I of Jesus Christ and His Good News? Today the Church suspends her reading of Mark’s gospel for the next four weeks in favor of reading the famed narrative of the Bread of Life discourse of Jesus from the Gospel of John. Here the Church asks us to meditate on the life-giving food, the Eucharist, which Jesus gives to us as His supreme gift of love and life. Here the abundance of the sacred banquet is beginning to be known. The readings this 17th Sunday through the year, taken together provide a framework for how are Christian lives are lived: in recognition of the Providence of God that is lavished upon us. In theology school a professor of mine, Jesuit Father Daniel Harrington, often encouraged us to preach on the responsorial psalm because it is the link between what is heard in the first reading and the gospel. Admittedly, the psalm response is rarely looked at by the preacher and often preaching on the psalm can be difficult if the psalmody is not part of one’s daily bread at prayer. But today Psalm 145 is provides us a most excellent, fitting link between Second Kings and John 6: the Lord will feed His people. The psalm response is “The hand of the Lord feed us; he answers all our needs.” Wow! The Lord indeed is good and wants our happiness. The Lord will feed us. He will answer our every need. What a tremendous consolation to know that we are not left orphan in this world and that God hears our petitions and wants to see us thrive. But our thriving is not meant only for ourselves but for Him and the community of faith. What other good news can there be than to know that God sustains our every moment. The verses of the psalm can’t be overlooked. There we hear the experience of the Jewish people giving thanks to God by blessing His holy name. And in turn, the people have the expectation that their King will help them “in due season.” Psalm 145 shows the give-and-take between God and His people. It is the same for the relationship we have with Jesus. Theologically we believe that these expectations are not self generated but are put into our hearts by the Lord Himself. He made us, He sustains. He calls us into greater communion with Himself. The desires of our hearts are none other the desires of the Lord: we are made for Him alone. The psalmist recalls for us that the Lord will satisfy our hunger, He will feed our bodies and souls because He hears us. Consequently, our relationship with the Lord will not be frustrated because His promises are true. In the inaugural homily of Pope Benedict in April, 2005, he said those who give themselves over to the Lord are never disappointed; nothing good in ourselves will be forgotten. The pope’s message to the world was and continues to be one that says he or she who abandons the self into the Lord’s hands will be fed. That is, our life in Christ is one of trust, one hope that doesn’t disappoint. Today, Saint John tells us that that humanity’s longing is to be fed by the Lord. The desire of humanity’s heart is on fire for something more than the daily fare of food and drink that doesn’t satisfy. 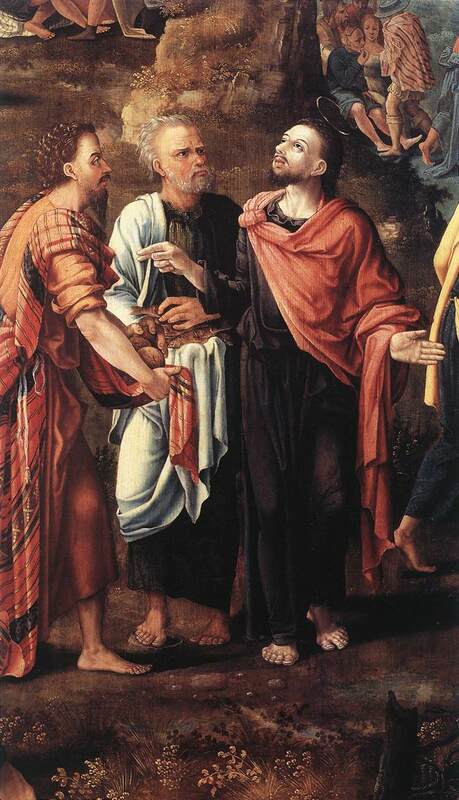 As Saint John tells us, the Lord instructed the Philip and Andrew to feed the crowd themselves. They had been following the Lord for a period of time and presumably knew the ways of the Lord by the way He fed the desires of the human heart. Philip and Andrew experienced first-hand the incredible life-giving food given by the Lord. Not relying on themselves the apostles relied on the word of Jesus and a boy’s barley loaves and fish. The apostles’ reliance leads to the miracle of an incredible feeding of the crowd that no human act could do. We are told that the Lord gave thanks (he prayed). He lifted his mind and heart to God by asking His Father to satisfy the hunger pains of His children. And as John narrates, God the Father supplied the need. This gospel passage is an example of the Providence of God caring truly for His people. It wasn’t as some contemporary scholars and preachers say: the human sharing is the miracle. No. The miracle is the trust, the asking, the giving thanks and the reliance on the only Person who can truly, really answer our human need. “The hand of the Lord feeds us; he answers all our needs.” Jesus’ asking the Father to supply our need is the miracle; it is the supernatural intervention into human history. The miracle lies not in human actions but in the Divine outpouring of Life. It is in Jesus that God the Father stooped down into our history to raise up the needy, the poor, the vulnerable: all of us. In John 6 we see Christ the priest mediating for us who beg to be fulfilled. The loaves and the fish are a prelude to Jesus instituting the Eucharist and the priesthood. By themselves bread and fish aren’t the pledge of future glory. Loaves and fish will never satisfy because they will never be enough. But what God said in Kings and what John tells us of Jesus, the Father gives what we need. In fact, The Lord gives us more than we can ever imagine. Why? Because Jesus is the food that satisfies; Jesus is that pledge of glory to come; He is the one who gives food and drink that satisfies our hunger and thirst. There is the hope, there is love between the divine and the human. Yesterday there was a story that caught my attention at the Catholic News Service (CNS) site: “Father’s suicide attempt leads Catholic family to help others.” The odd thing for me is that yesterday I put out in the parish vestibule a booklet on suicide (see below) thinking it might be helpful to some of the parishioners because the topic seems timely and since a young man accidentally committed suicide last year here. Facing our own human frailty and that of others confronts us daily. Few escape serious impact of personal issues which belong to us, or of those of others, especially if you are pastoral care worker, teacher, nurse, doctor, priest, etc. Mental illness, the various forms of depression, emotional issues, un-processed feelings and the like all impact our lives in ways that may or may not be known to us. Certainly, some people attempt suicide to get attention, others involuntarily commit suicide while still others actually intend to do that desperate act. My first experience of suicide was during my high school years when a teacher of mine committed suicide. Over the years I’ve known of others –through pastoral engagements– who wanted out of life and others who were playing a game and one-thing-led-to-another. The fact is, suicide is a reality in our lives and we have to deal with it sensitively and competently. When I was at the Catholic Information Service at the Knights of Columbus I edited what I think is a helpful booklet to assist students, parents, clergy, pastoral care workers, teachers, really anyone interested in helping another understand the reality of taking one’s life and how to be attentive to suicidal signs. It is not enough to parrot the Church’s teaching and point someone to the necessary resources; you have to act like Christ and be knowledgeable enough to respond humanely and spiritually. Professionals have their work to do and friends, family and other friendly people have theirs. Read “Coping with a Suicide: Catholic Teaching and Pastoral Practice.” You can order a hard copy by sending an email to cis@kofc.org. would witness some progress in our becoming more like Christ.